I'd used earlier versions of Mint quite some time ago and thought I'd try it again, but this time on my EeePC 901. Really, though, I had too much stuff on this little machine, the majority of which I never used. So, I had Xandros, Ubuntu, Senryu, Haiku, DSL, Puppy, TinyCoreLinux and Moblin. That's eight OS's all squished into the <20MB of HDD space. Now I decided that it was time for a change. So, my current arrangement is to have just four OSes: Ubuntu, Xandros, Haiku and Linux Mint. Actually, I'm not sure if I'll stay with Xandros as it too is never used. I really don't like these simplified, Windows-like versions of Linux such as Moblin and UNR. 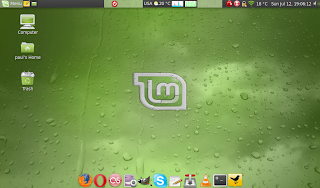 In any event, Linux Mint was very simple to install (3.4 GB /, 2.5 GB /home) using Unetbootin. Indeed, the install and subsequent operation, once again, showed me how similar Mint is to Ubuntu (on which it is based). Indeed, up to now, I really haven't seen anything much to convince me that I'm not using Ubuntu, it is just so similar. Perhaps the only difference is the colour scheme and sounds. Wireless worked OOTB and no problems of any kind were met in getting it set up. I installed Kiba-Dock without problems. The only strange thing here was that dragging icons/apps from the Mint menu didn't produce icons in the dock. Instead, it was necessary to drag the icon/app to the main panel and then drag from there to the Kiba dock. Weird. Other than that, just about everything works without me needing to do anything including sound, video, webcam. And if you know Ubuntu, you can assume that Linux Mint won't surprise you in anything.